It’s noon, and I feel like my day has hardly begun. We haven’t started school, the house is a wreck, and I haven’t given lunch the slighted thought. Somehow time has just slipped away! Does this ever happen to you? You have the best of intentions and then life happens, and the time is gone. I know what it’s like to struggle with time management. In fact, it is BECAUSE I struggle with time management that I am consciously finding ways to take better control of it. My Grace-Filled Planner was even created out of my desire to take life by the handles and gain some control. 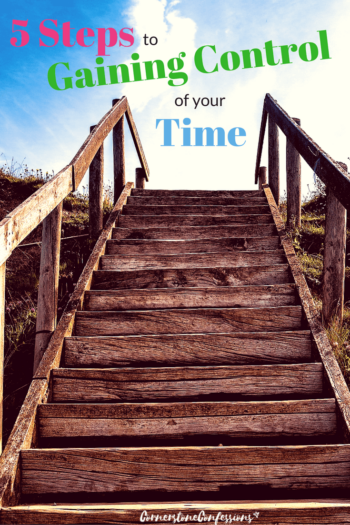 Thus, if you struggle with time management, let this post be an encouragement to you. 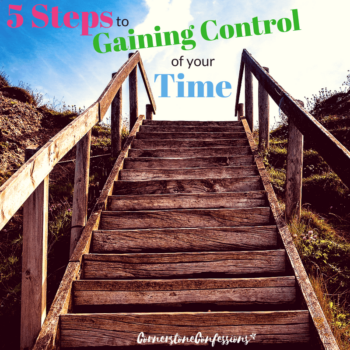 Gaining control of your time is possible, and it can all begin with these 5 simple steps. 1. Make a list of priorities/goals. With whom do you want to spend the most time? How many nights do you want to have at home? Out with friends? Dating your hubby? Or some other event? List them in order of priority. What skills/talents do you want to develop/utilize this year? Do you own a home? If so, how important is the upkeep to you, and how much time are you willing to devote to that upkeep? 2. Make a list of your current commitments and analyze them. How do they line up with your list of priorities/goals you created in step one? Do you need to eliminate or alter a commitment to better fit your priorities? If your commitments don’t exactly line up like you’d like, what can you give up? Divide your commitments into two categories–those that you want/need to participate in, and those that are just time wasters. Aim to keep as many activities as possible in the first category and eliminate as many commitments as possible in the second category. God gives us our priorities. Who should be first on the list? God. 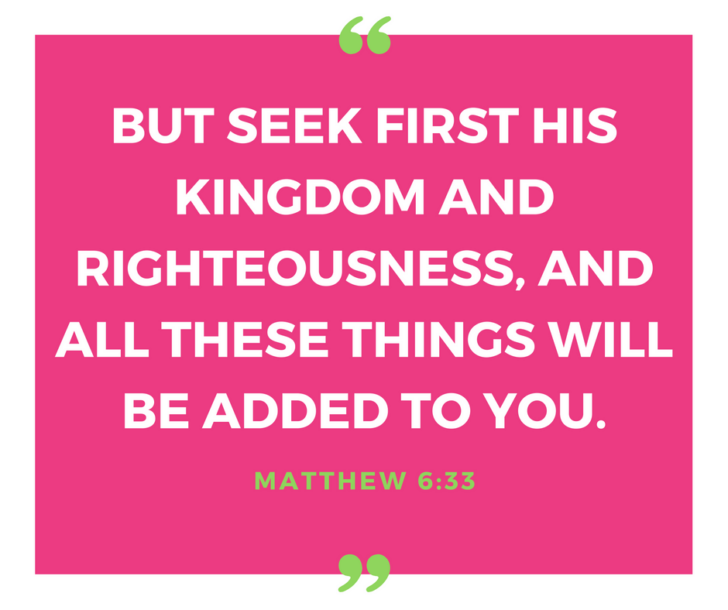 What should we pursue first with our time? His righteous. See, even the Bible talks about time management! Create an order of events or a routine that you AND your family can follow. Yes, it does need to be somewhat time oriented for the benefit of all. Think Nanny 911. What’s one of the first thing she usually does when entering a client’s home? She creates a schedule for them. It’s beneficial to both parents and children alike. Not sure where to start? Feel free to use our routine as a guide as you create your own schedule or routine. Everyone likes to know what to expect. Tip: Be sure to include some time for yourself on your schedule. Proverbs 31:17 says, “She girds her waist in strength, and makes her arms strong.” (Proverbs 31:17) Yes, even the Proverbs 31 lady made time to exercise and prepare herself so she could take care of her family and serve others. Allow yourself the same privilege. What kind of list system will you be most likely to use? Are you a pen and paper kind of girl? You may like something simple like a Task Notebook or a downloadable planner to help you get organized with your chores. Prefer online planners or ones you can access on your phone? My go-to is currently Todoist which has taken my Task Notebook to a fun digital level. There are lots of ways to organize your chores and to-do lists. Just choose one and watch those tasks become more manageable by the minute. 5. Keep ONE master calendar for the whole family. Again, there are different kinds of calendars for different personalities. You may choose to create an online calendar such as a Google calendar. Or, you may prefer a small pocket calendar for your purse. You may prefer a large refrigerator calendar made with post-it notes or a small wall calendar you got free from your local library. Whatever you choose, just make sure you have a calendar that EVERYONE in the family can view and/or update. I recently learned this the hard way when my husband and I had two different calendars. Let’s just say, we didn’t always make it to the same events on time. Now, I post a monthly Google calendar on the fridge which we can all keep up-to-date via our electronic devices, and use this Weekly Schedule Printable to keep the kids “in the know. Whatever you do, find what works for you and your family, and stick to it. As Ecclesiastes 3:1 states, “For everything there is an appointed time, a time for every matter under heaven….” EVERYTHING requires some amount of time. EVERYTHING. Nothing we do can be done without the concept of time. So, it’s not a matter of whether it takes time or not; it’s a matter of how we’re going to use this time we’ve been given. So where does that leave us? Where are we going to spend our time? What priorities will we choose as a result? How will our time management reflect our priorities and relationships? My hope is that we use our time wisely and make the most of it. After all, we really are but a dot in the line of history. Got any time management tips? Keeping our priorities front and center will help in scheduling our time. Most people squander way too much time and then wonder why their priorities never got done.